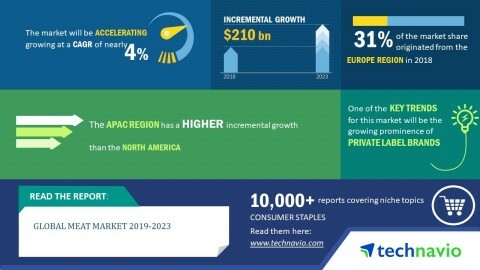 The global meat market research report by Technavio predicts the market to post a CAGR of close to 4% during the period 2019-2023. A key driver for the global meat market is the rise in meat consumption. The global per capita consumption of meat has been growing steadily over the last decade. Also, the growing population is driving the meat market, resulting in increased production capacity and supply. The people have become more conscious of protein intake in their daily diet, which has led to increased meat consumption. As per Technavio, the growing prominence of private label brands will have a positive impact on the market and contribute to its growth significantly over the forecast period. This global meat market 2019-2023 research report also analyzes other important trends and market drivers that will affect market growth over 2018-2022. Many major retailers around the world have been introducing their brands of meat products to capitalize on the rising demand. The private label processed meat products are affordable and ready to cook and hence, they are becoming popular among consumers. These meat products are stocked at retail stores and are attracting consumers as they are available at prices lower than those of branded products. “The private label product segment grew in terms of scope and size during the last decade. The price-sensitive consumers are more likely to purchase private label meat products owing to their low cost. Some of the private label meat products in the US are Great Value from Walmart and Archer Farms Foods from Target,” says a senior research analyst at Technavio. This meat market analysis report segments the market by product (pork, poultry, beef, and others), type (processed and fresh), and geography (APAC, Europe, MEA, North America, and South America). The pork segment held the largest meat market share in 2018, accounting for nearly 46% of the market. This product segment is expected to dominate the global market throughout the forecast period. Europe led the market in 2018 with approximately 31% of the market share, followed by APAC and North America respectively. Europe is expected to dominate the market throughout the period 2019-2023.